Spain’s Prime Minister Mariano Rajoy has warned that the country is in “extreme difficulty”. The statistics for Spain are shocking, even in a world becoming used to terrible economic data. 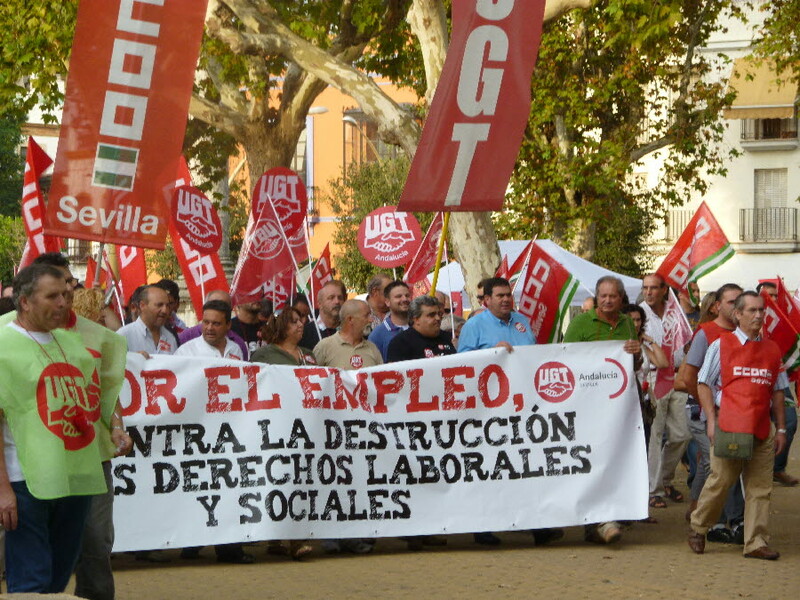 According to Eurostat, 5 million of the 17 million unemployed across the euro zone, are in Spain. The unemployment rate here, at 24.3% is the highest in Europe (yes, higher even than Greece). But even more socially devastating is the 50.5% unemployment among the under 25s. 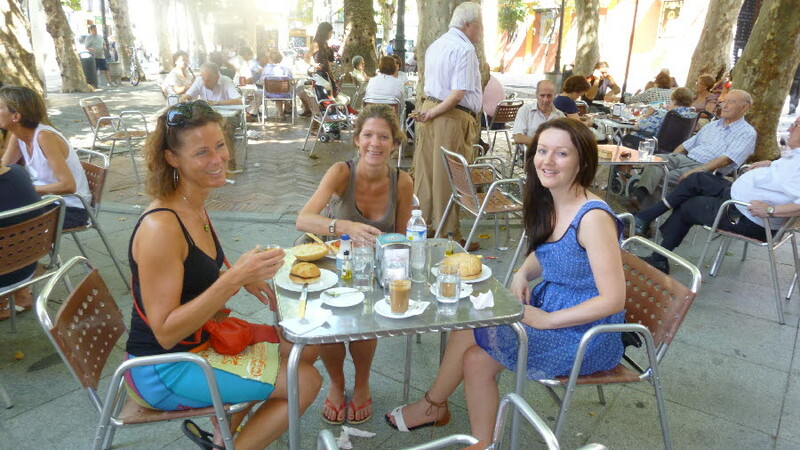 Some argue that Spain’s enduring traditions, many of which I’ve written about in this blog, are contributing to their economic woes by taking too many working days out of the year. During Semana Santa, for example, cities and towns stop functioning as normal and the streets are gridlocked for a week with parades and celebrations. If it was only Holy Week, perhaps it wouldn’t have a significant effect on the economy, but in Spain, and particularly Andalucia in the south, one lengthy fiesta follows another. 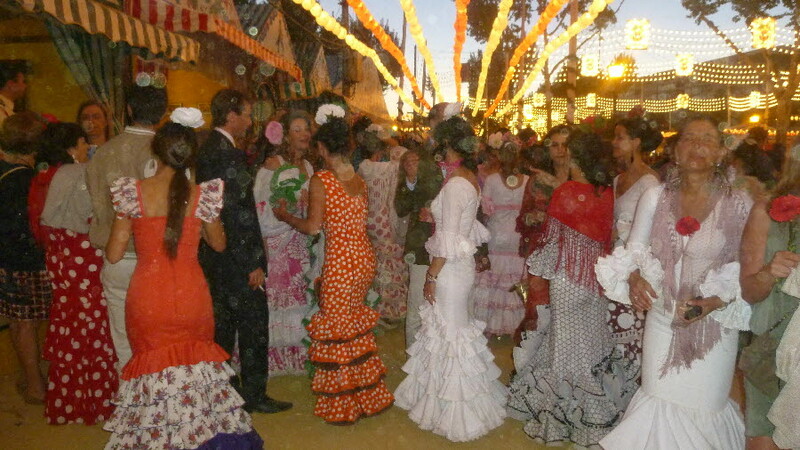 Just two weeks after Holy Week in Seville, there is another full week of festivities for the annual Feria, when the whole city decamps to a fairground south of the river to party night and day. 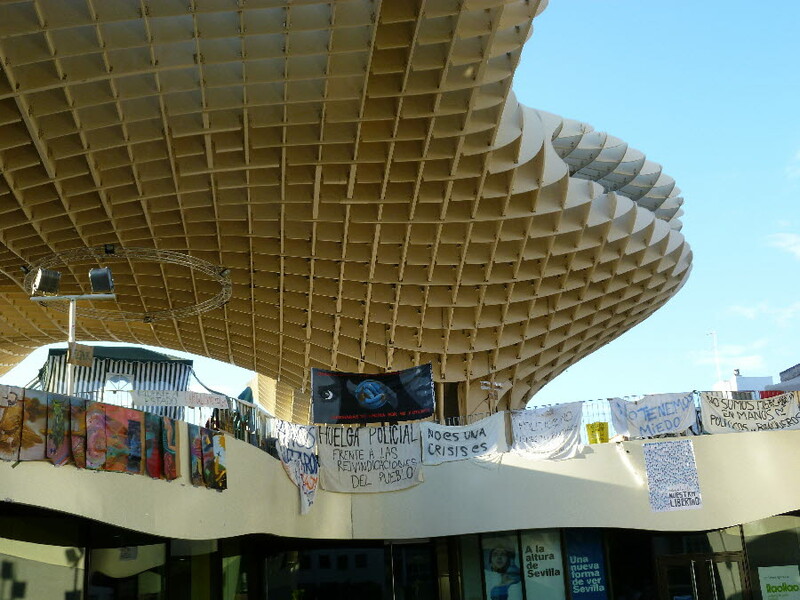 Seville, as ever, does it bigger and better than anyone else, but every town and city has its own festival. 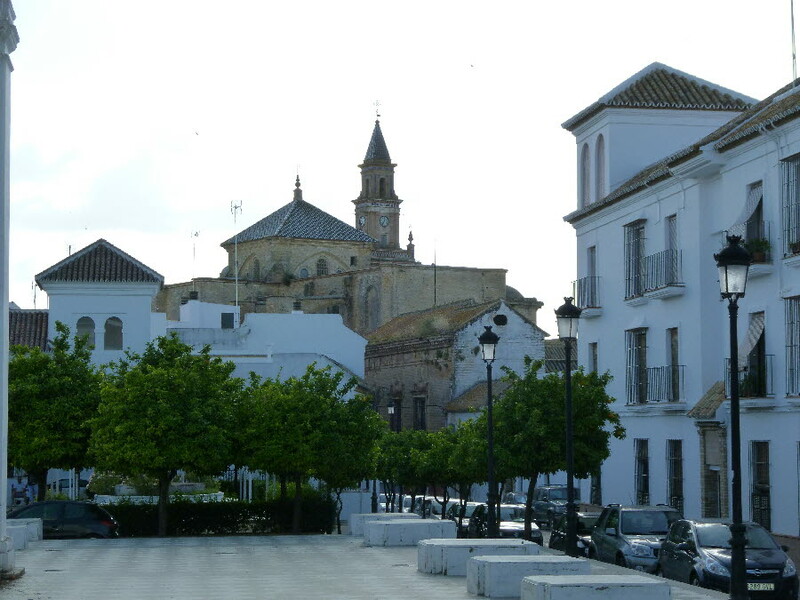 In May comes the annual pilgrimage of El Rocio; half party, half religious festival, when hundreds of thousands of pilgrims from all over Spain spend up to 4 days travelling to a small town in Huelva Province to pay homage to a statue of the Virgin Mary. On the positive side, all of this local colour draws much-needed tourist visitors to the country. Andalucia, the most populous and impoverished region of Spain, which includes the Costa del Sol as well as being the home of flamenco, bullfights and the biggest and best festivals, has seen an increase of 10.4% in foreign visitors in the last year (and 8.1% nationwide). 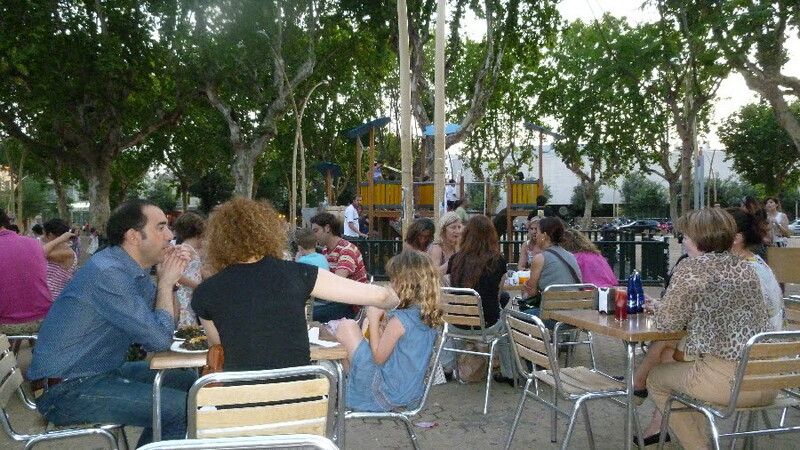 Tourism is the only growth industry in Spain. By contrast, the number of people unemployed nationally in the devastated construction sector is now higher than the number employed in it. 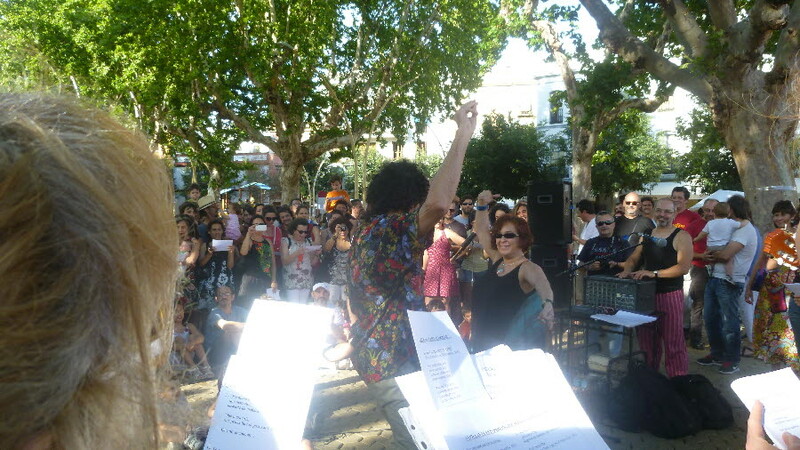 The various festivals also create employment directly, not just in the seasonal service industries, but for craftsmen whose products make an essential contribution to the festivities: from silversmiths and embroiderers to candle makers and florists, as well as the tailors who make the penitents’ robes and the party flamenco dresses. On the downside, productivity is lower in Spain than anywhere in the EU, with the exception of Greece and Portugal, and it’s not only due to the frequent festivals. As the European Working Conditions Observatory (EWCO) tactfully puts it “In Spain, official working hours differ from actual working hours. This imbalance is probably due to cultural patterns that are different to those of other countries.” The long and late lunch break (usually 3pm to 5pm) doesn’t coincide with timings in the rest of Europe, making it difficult for businesses to communicate with other European countries. Because of the heat (especially in the south), workers start the day early, but often don’t return to work after leaving for lunch at 3pm, especially during the summer. The heat is punishing and it is understandable for manual workers, but less so for office employees, who have air conditioning. The traditional lifestyle is bad for productivity, but great for morale. 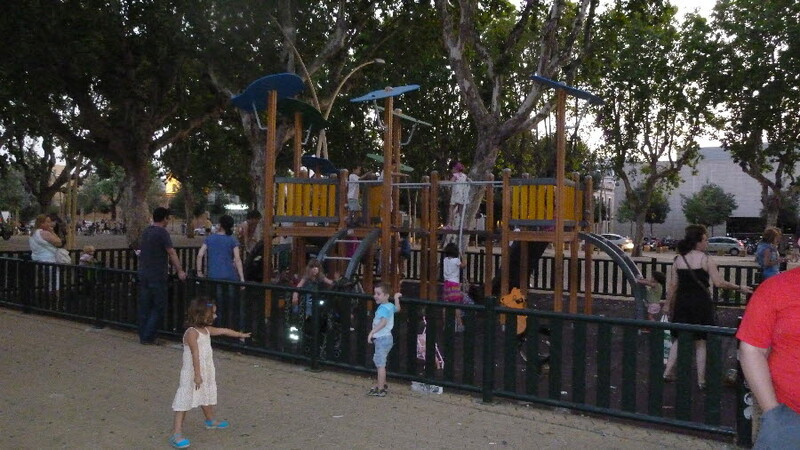 Spain comes second out of 10 European countries in the uSwitch Quality of Life Index, while the UK is bottom. Spain has the most holidays, the most sunshine and highest life expectancy – no wonder it’s also by far the top choice for Brits considering emigration within the EU. While record numbers of young Spaniards are flocking to the UK looking for jobs, the number of Brits moving to Spain is still increasing year on year. It is evident that morale is also sustained by the strength of tradition here. In April, for example, after a week which included a general strike opposing labour reforms and an austerity budget, people put their worries aside to immerse themselves enthusiastically in Semana Santa. If you haven’t seen it, it’s hard to imagine the atmosphere, with every street filled with tens of thousands of good natured people, united in their passion for this custom – the closest British equivalent I can think of is the Queen’s recent Diamond Jubilee celebrations at the Mall. It’s impressive that such ceremonies have survived little changed in Spain over centuries, and are still embraced wholeheartedly by people of all ages. The lack of cynicism is striking. And it’s not only the rituals and fiestas which unite communities in the face of hardship, but the maintenance of traditional extended families and networks of friends who support each other in real practical ways, as well as providing emotional sustenance. It may appear old-fashioned while much of the western world is moving towards modern uniformity – but the solid structures of tradition seem to be holding together a society that, in the current harsh economic circumstances, you might expect to see collapsing. Tradition in all its guises is both Spain’s strength and its weakness. Reform is inevitable and necessary in the face of the catastrophic economic situation, but it will be a struggle for the government to change a culture written into the country’s DNA – and I will join the Spanish in mourning its passing if they succeed. Just one week to go and everywhere in Seville preparations are being made for the biggest religious festival of the year, Semana Santa. Next Sunday – Palm Sunday (Domingo de Ramos) – kicks off a week of highly theatrical parades through the streets, in a mixture of devotion and partying that only the Spaniards can pull off. Seville is renowned for having the most spectacular Holy Week celebrations anywhere in the world. Each church in Seville has its own brotherhood (hermandad) of laymen, who take part in processions wearing hooded robes reminiscent of the Ku Klux Klan, and carrying floats bearing life-size effigies of Christ on the cross and the Virgin Mary grieving. Between Palm Sunday and Good Friday, 58 processions of up to 2800 penitents each, take place night and day, watched by crowds of close to a million people. The staggeringly heavy floats (or pasos), laden with church silver, statues, flowers and candles, are carried above the heads of dozens of heavily sweating men, the ‘costaleros’. 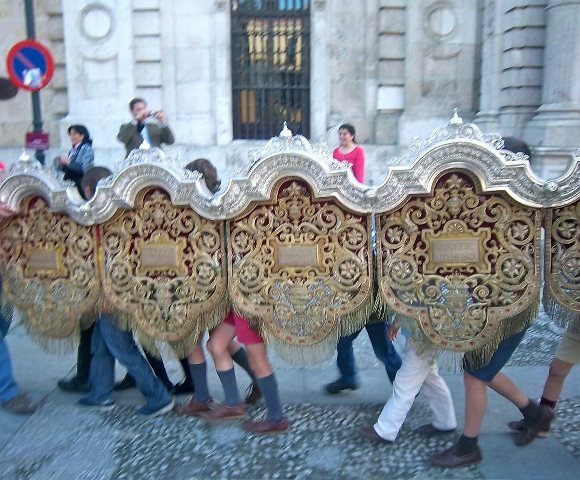 During Semana Santa, the costaleros will be hidden beneath the rich fabric that skirts the base of the float like an altar cloth, but during the weeks beforehand, they can be seen practising, unadorned in the streets. The biggest guys get this job, and it is not a pretty sight! Bellies hanging out of vests, trouser legs rolled up and protective fabric wrapped around their heads like turbans, they are packed closely together to maximise the lifting power. 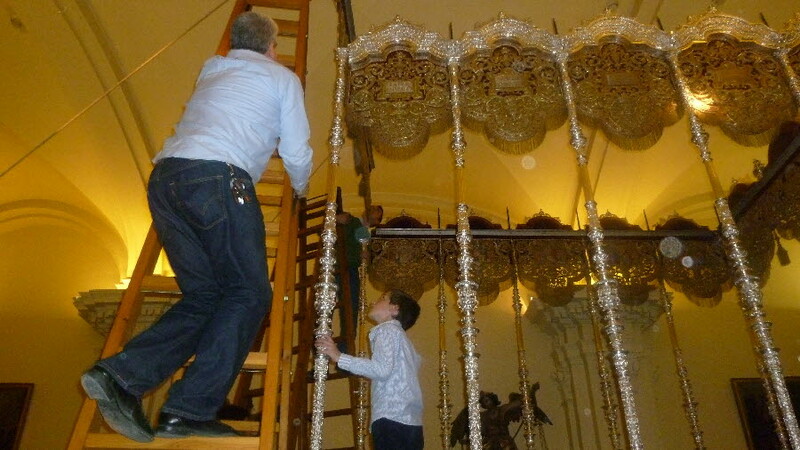 For weeks, young people have been sitting in church doorways, polishing the huge and intricate silver pieces that form part of pasos, and last weekend the brotherhoods began to assemble the huge floats. I was lucky enough to see this happening at the chapel of the ‘Estudiantes’ (students) brotherhood, allied to the University of Seville. They make a lovely family occasion of it, inviting the youngest child in the families of brotherhood members along to help, followed by an afternoon tea. It’s all pretty chaotic inside the small chapel. 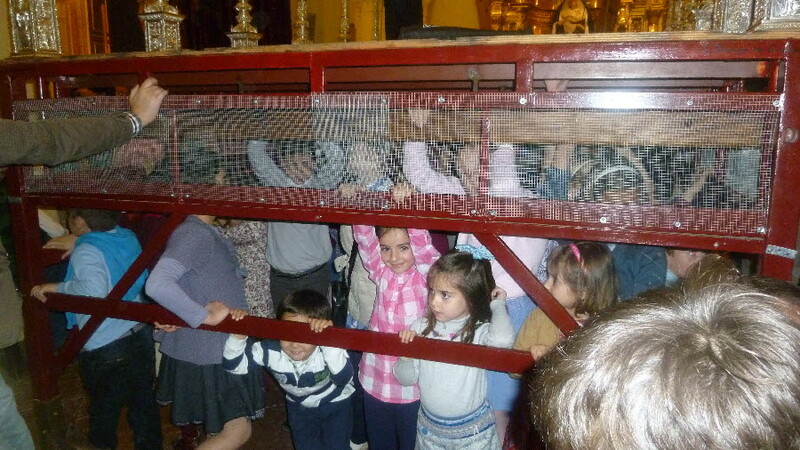 As adults construct the float, which reaches almost to the roof, dozens of small children stand underneath in place of the costaleros, enclosed like battery hens in a cage. 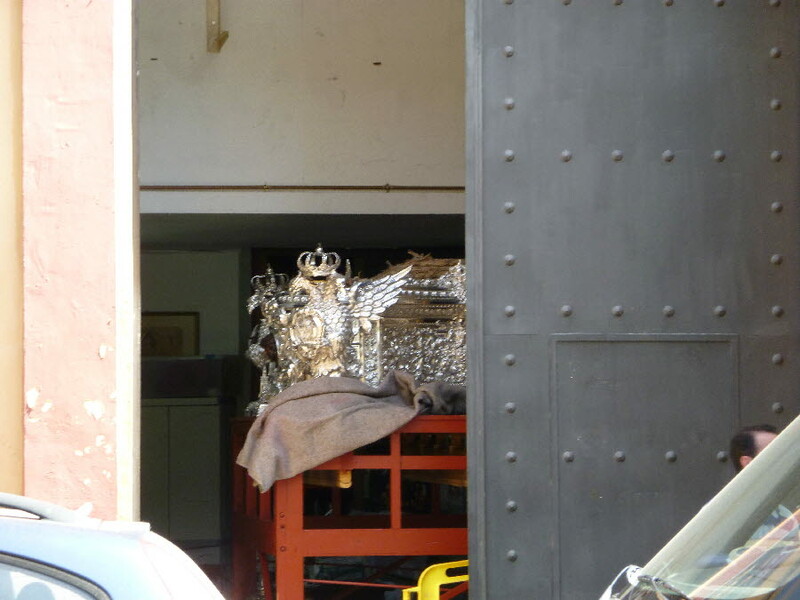 The float is temporarily held up on supermarket trolley type wheels and is regularly moved to aid assembly in the small space, which results in all the little kids stumbling around underneath – quite alarming to watch for a health and safety conscious Brit..! 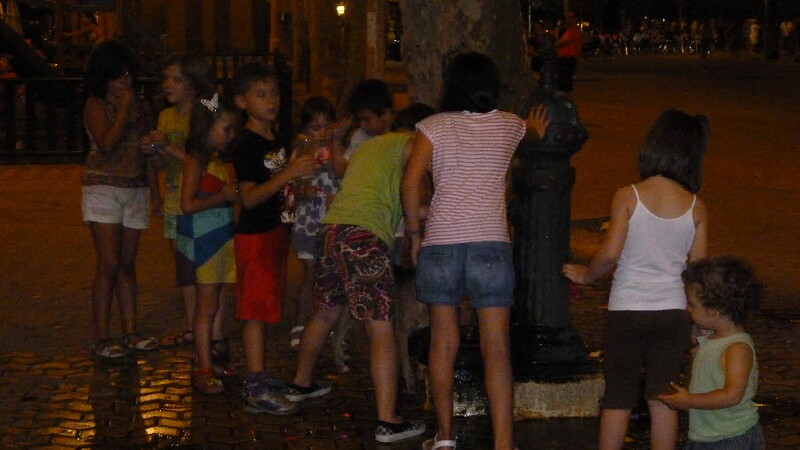 I do admire the way Spanish people involve their children in everything though – all of the families’ youngest had been invited by personally-addressed letter to help with the preparations, and they clearly love being involved. 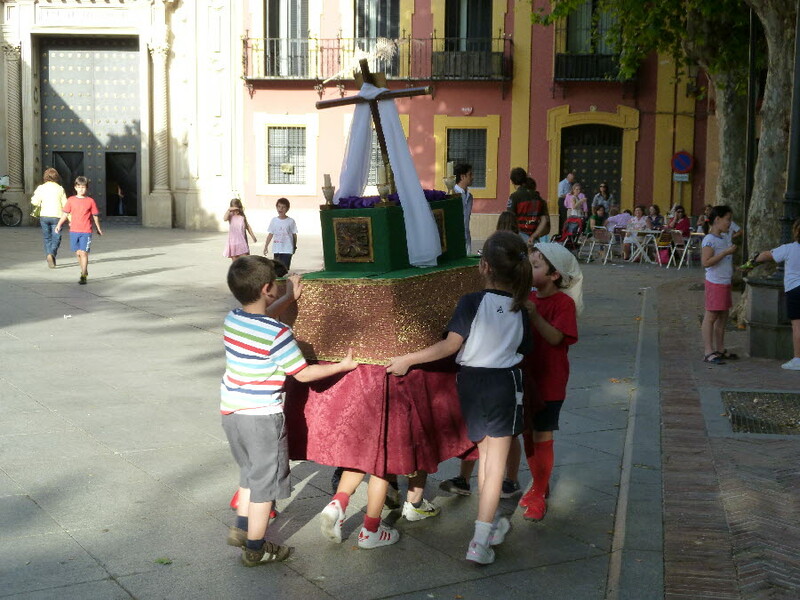 It may also help explain why the tradition has carried on unchanged over centuries, as each new generation takes ownership from an early age and children even play at Semana Santa, looking forward to being old enough to join the grown-up parades. Chicas, you will be proud of me – with ‘The Spaniard’ away in Madrid on some pretext or other, I determined to have a very cultural weekend in his absence. It started on Friday afternoon when my lovely friend Miguel kindly took me to visit Carmona. 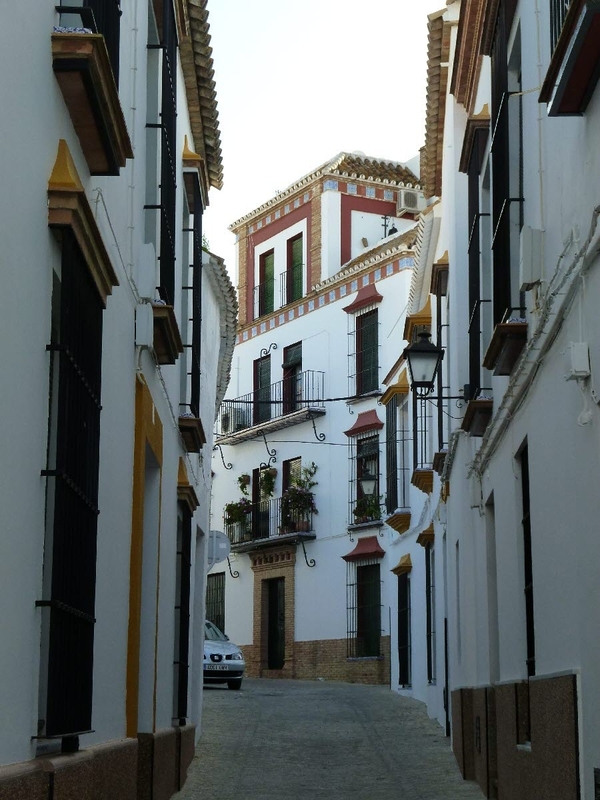 Carmona is a small and ancient town about 30km outside of Seville and I highly recommend a visit there. It’s one of those places that is so full of history, beautiful buildings and local colour that you want to photograph absolutely everything you see (which I pretty much did!). Like Seville, you can see evidence of all of the stages of Carmona’s history, with its power battles and changes of rulers and culture, in the impressive buildings that remain. The main city gate, dating from the 9thcentury, has remnants of wave after wave of settlers: Eastern Mediterranean, Phoenicians, Carthaginians, Romans, Moors and finally Christians. 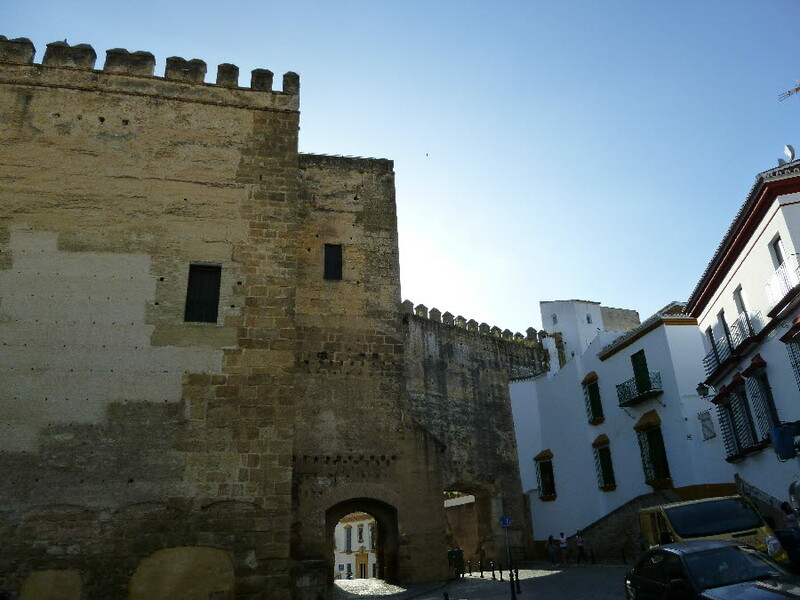 The Alcazar (fortress palace) which majestically dominates the highest point in Carmona, was originally built by Muslim rulers in the 11th century, but later taken over and redeveloped by Christian King Pedro ‘The Cruel’ (he sounds an interesting type…). 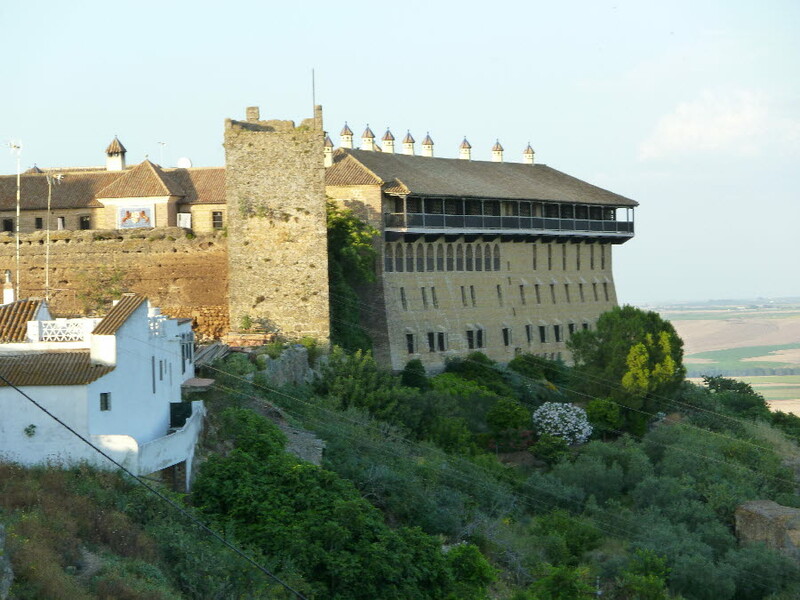 This magnificent building is now a very swishy Parador (state owned hotel), where it is almost impossible to get a booking as it’s permanently full. However, they do let ordinary folk like you and me come in to have a drink on the terrace balcony, with fabulous views over the vega – which Miguel and I took full advantage of. Miguel had just had his family lunch (it was 6pm for Pedro’s sake! ), but I was ready for a tapa too. 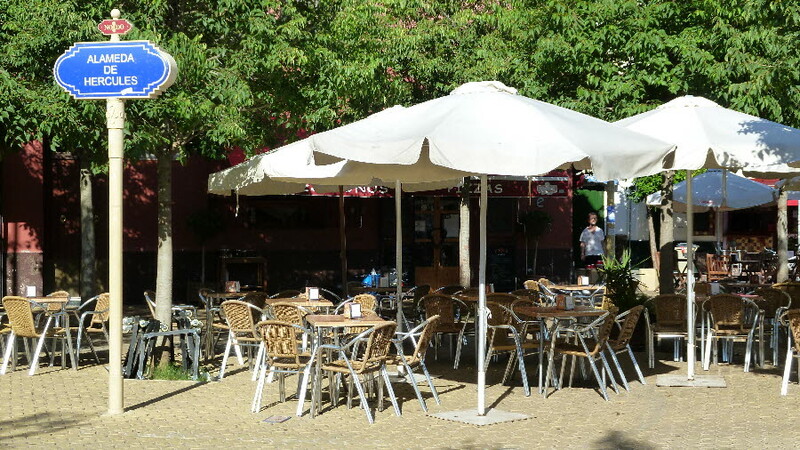 He chuckled indulgently when I said I would have a beer, implying that it was a bit early – our Spanish friends really are on a different time schedule to us Brits! The historical power changes are just as visible in the religious buildings. 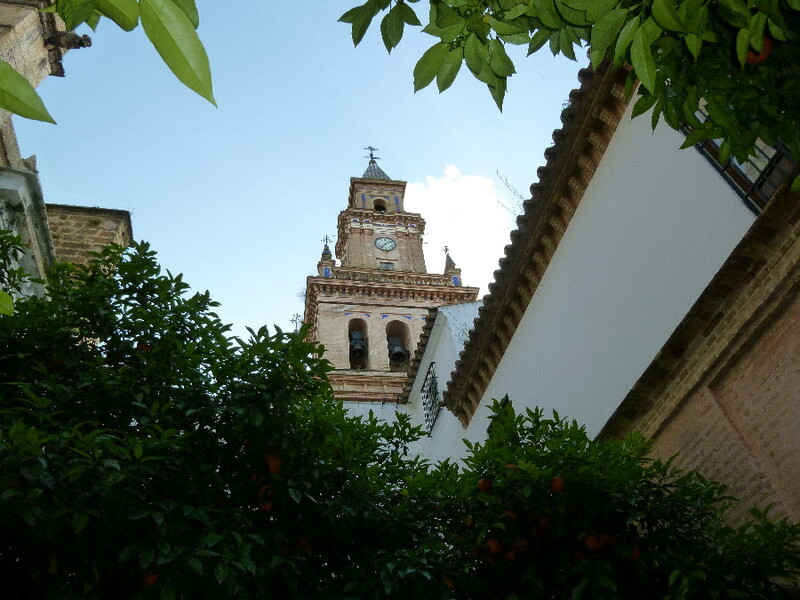 At the church of Santa Maria de la Asuncion, for example, a 15thcentury Gothic building full of the gold and silver treasures and ornamentation of a Catholic church, the orange tree patio of a mosque remains, where Muslims would perform their ablutions before praying. Within this courtyard is the last remaining evidence of the Visigoth temple which existed before the mosque, in what I am reliably told, is one of their calendars. 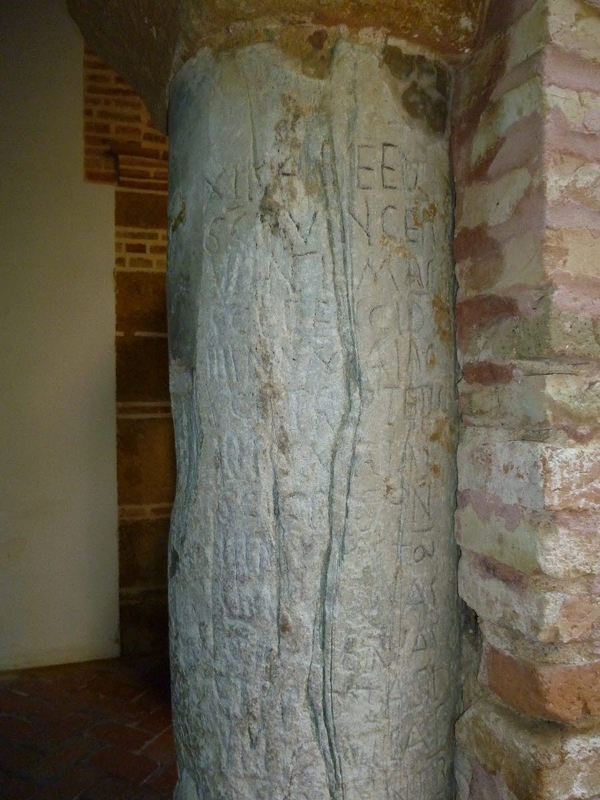 I know you’ll be imagining some colourful pictures of Visigothic children at play, with days of the month neatly set out underneath, but no, this was a white pillar with some messy carving on it. OK, on Saturday I just lounged around in a lazy manner, but on Sunday the cultural theme continued when I went to the Book Fair (Feria del Libro) with my new friend and published poet, Lola Crespo (not to be confused with the British Lola implicated in my first blog post – in fact I’m going to change her pseudonym to Krissie, to avoid confusion…). Spanish Lola (her real name, she is a respectable person who needs no protection!) was doing a book signing at one of the stands. Afterwards, she took me to a remarkable performance by a poet called Fernando Mansilla. Even though I couldn’t understand all of it, the rhythm and music of the words and his very deep gravelly voice, were amazing. 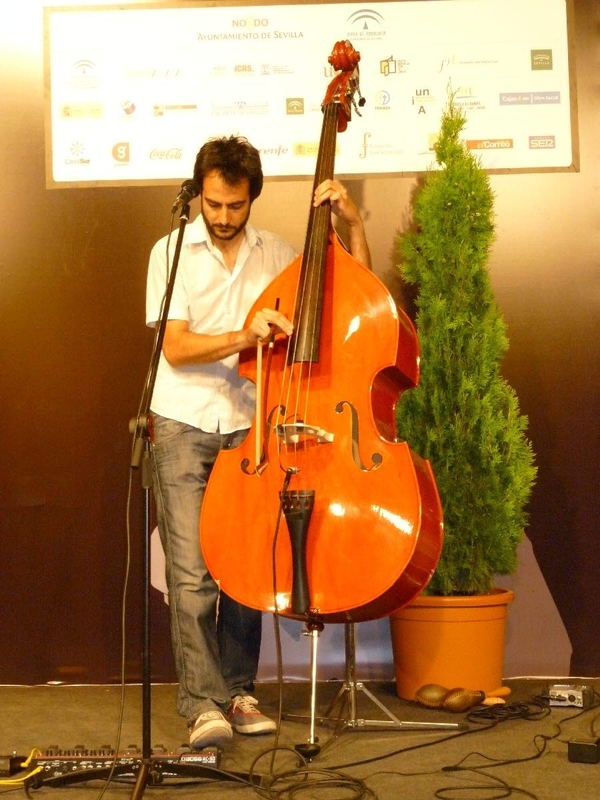 He did some of the poems to the accompaniment of music. The Spaniard is very strict about making me speak and write in Spanish – almost all of the time. In fact, we just had our first row about it. Well, to be fair, I had a row with him about translating something I’d written into Spanish for me. I went off on one when he had the temerity to suggest I should try it first and he would correct it – instead of reacting to my rant, he graciously capitulated and did it for me. Frankly, I think this was a clever ploy on his part to move me from righteous indignation and fury, to shame-faced sorry person in seconds – and it worked! 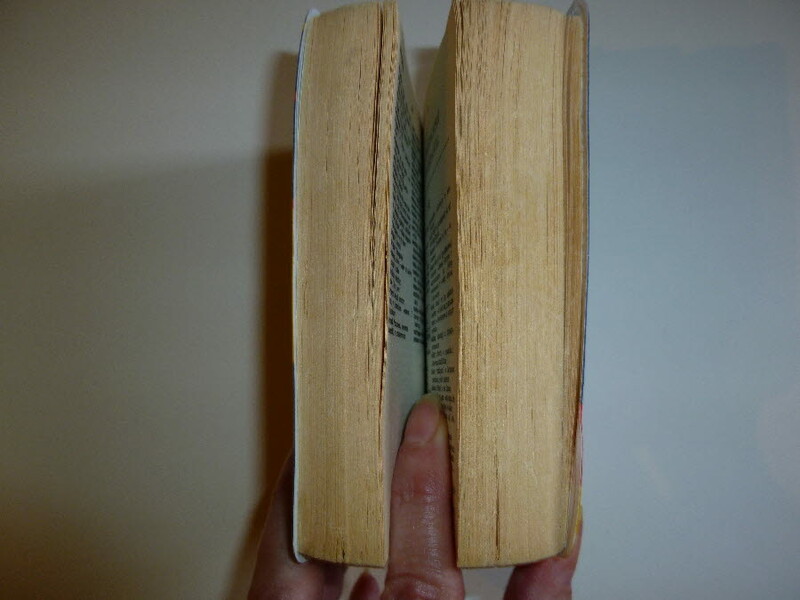 The Spanish language has fewer words than English, (have a look at the relative thickness of the Spanish and English sections of an English/Spanish dictionary – Exhibit A). I guess this is because the English language stems from many different sources – all those people who conquered our shores gave our language a lot of sources and nuances, whereas Spanish is mainly Latin, with a bit of Arabic thrown in from when the Moors occupied the Iberian peninsula in the Middle Ages (any word beginning with ‘al’ comes into this category). It’s also difficult for them trying to translate into English – the Spaniard told me I was really hitting him the other day. Bewildered (I am not abusing the poor man, I assure you), I looked up ‘hitting’ in the OM – it seems to have an implication of ‘affecting’ someone emotionally, as well as punching them. Hope it’s a positive effect – still not sure…. 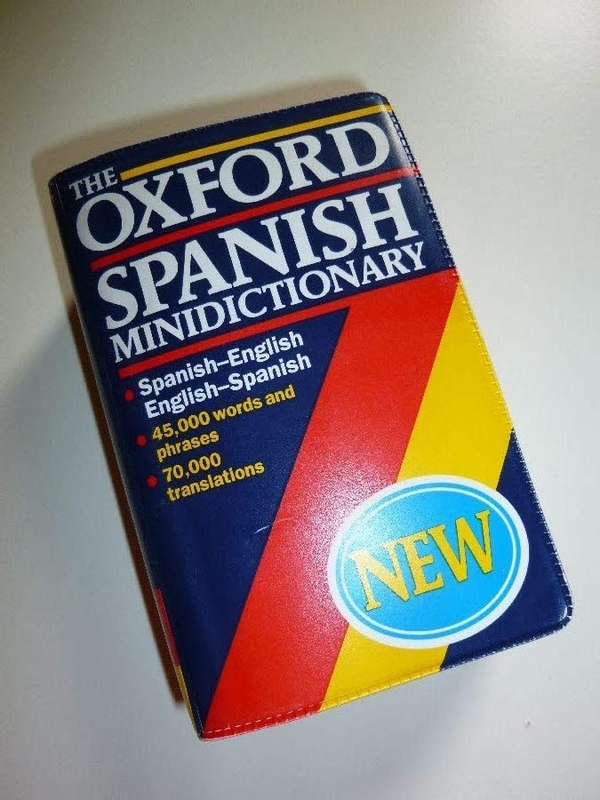 One thing that makes Spanish easier for us Brits however, is that every word we have that ends in ‘tion’ or ‘sion’ is the same in Spanish as it is in English (e.g. education = educacion, television = television). This means, you start out already knowing 100s of Spanish words – just put the emphasis on the end of the word and lisp a bit when there’s a c involved (e.g. educacion pron. educathion). On the other hand, there are occasionally what are known in the language teaching trade as ‘false friends’ – that is a word that sounds exactly the same, but has a different meaning… I discovered one of them in a rather embarrassing manner at the pharmacists, when asking for something for my constipation (I know, too much info, but bear with me). I couldn’t understand why she kept offering me Lemsips, until, on consulting the trusty OM, I discovered constipacion is having a cold – bunged up nose… The word for constipated, in case you need to know, is ‘estrenido’ – you can remember that, sounds like ‘straining’…. Back soon with more startling insights.